This Broccoli Rice Casserole Stuffed Tomatoes recipe makes for a quick, easy and light summer lunch dinner! With only 4 ingredients needed, the whole family can help to prepare this simple, healthy veggie dish! This recipe for Broccoli Rice Casserole Stuffed Tomatoes comes together within minutes. 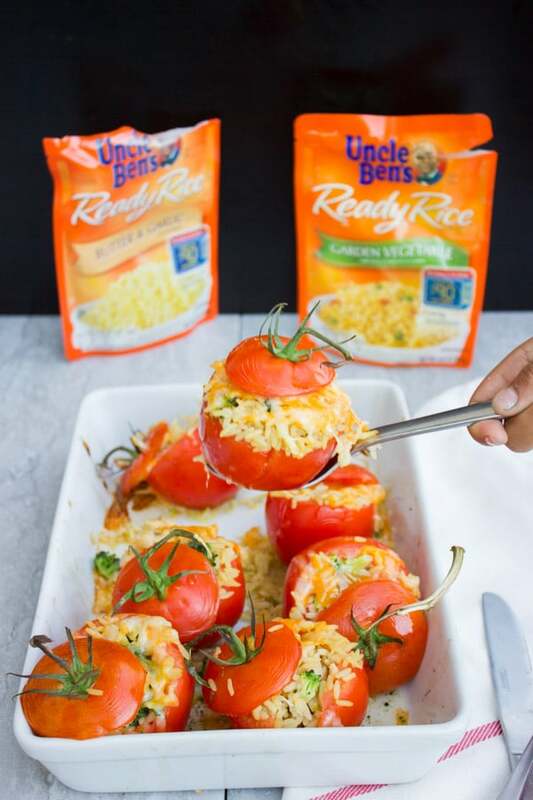 The use of pre-made, seasoned rice saves a lot of time an makes this the perfect last-minute dish to serve to your family! 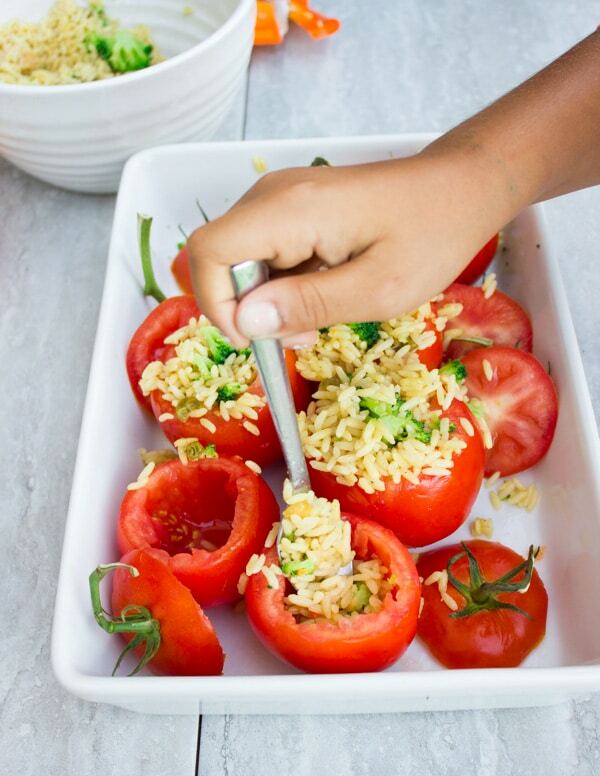 Kids love the combination of cheese and rice and the little tomatoes will look so fun to eat, that the broccoli hidden inside of the Broccoli Rice Casserole Stuffed Tomatoes will be eaten without complaints! Preheat the oven to 400 degrees F. Cook the rice according to the package instructions and let it cool for 5 mins before opening the bag fully. 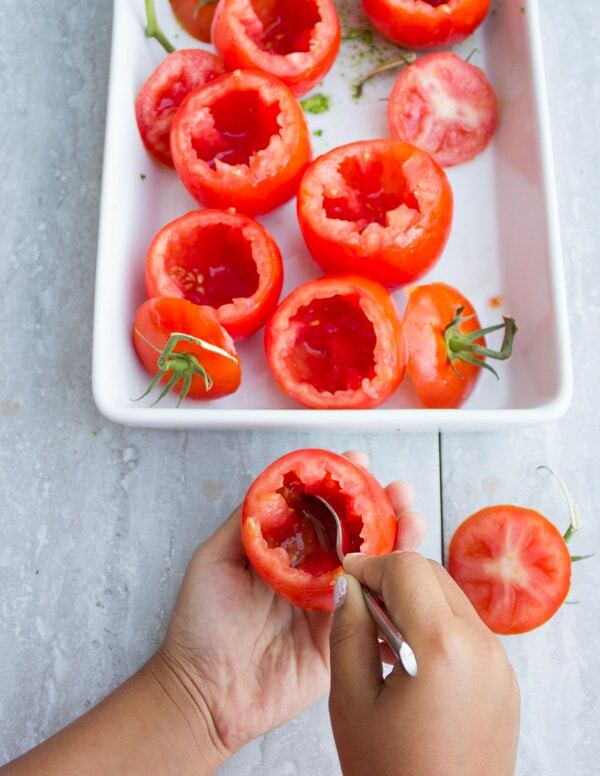 Cut each tomato top off and use a knife to gently break down the membranes on the inside of the tomato corners. Then, use a spoon and gently scoop out the flesh and any juices, leaving the tomato still intact to look like a cup. Repeat with the remaining tomatoes and arrange them in an oven-safe casserole dish. Pour the inside of the rice bags in a bowl and add the broccoli florets. Then, use a large spoon and fill the tomato cups evenly with the broccoli rice casserole filling. Sprinkle the cheese evenly on top of the Broccoli Rice Casserole Stuffed Tomatoes and place the tomato caps on top. 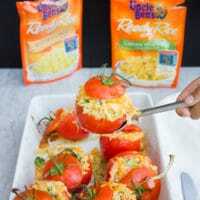 Bake the Broccoli Rice Casserole Stuffed Tomatoes for 12-15 mins until the cheddar cheese is bubbly and the stuffed tomatoes are slightly tender. If cooking your own rice, make sure to season it with butter, garlic, and salt. Adjust seasoning of the Broccoli Rice Casserole filling to your taste. This recipe for Broccoli Rice Casserole Stuffed Tomatoes also works with peas or cauliflowers. Cook the rice according to the package instructions. ( Open a small slit at the top and microwave for 90 seconds). Let the rice cool for 5 mins before opening the bag fully. 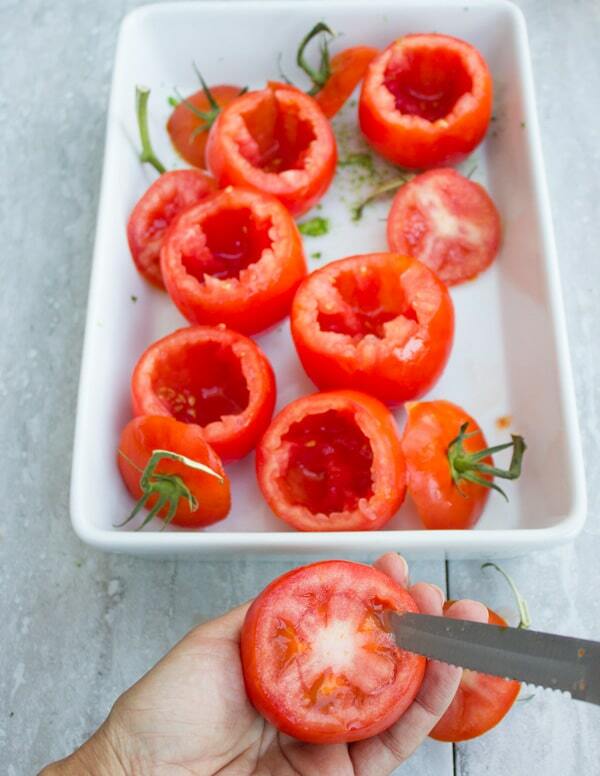 Slice each tomato top and use a knife to gently break down the membranes on the inside of the tomato corners. Then use a spoon and gently scoop out the flesh and any juices, leaving the tomato still intact to look like a cup. Repeat with the remaining tomatoes and arrange them in an oven safe bakeware. Pour the rice bags in a bowl and add the broccoli florets to them, then use a large spoon and scoop out the rice to fill the tomato cups evenly. Sprinkle the cheese evenly over the rice-filled tomatoes and place the tomato caps over them. 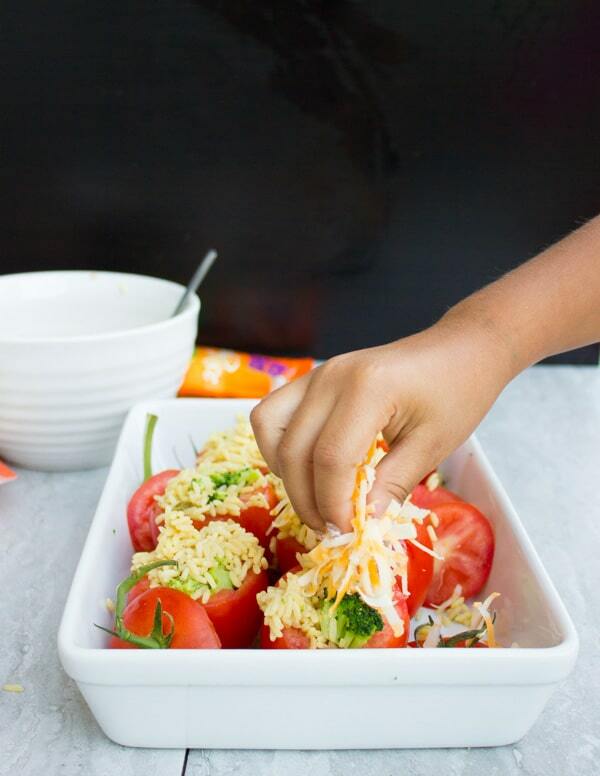 Bake the tomatoes for 12-15 mins until cheese is bubbly and tomatoes are slightly tender. Wait for 5 minutes for the cheese and tomatoes to cool down a bit and enjoy! 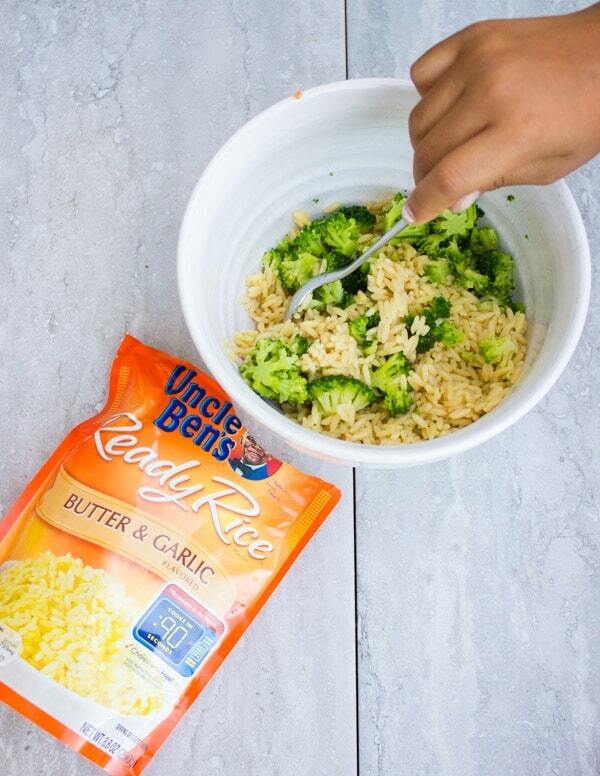 we use those ready rice packets all the time during the week when we’re super busy! I love them. what a great idea for use in this casserole. so yummy! I love a quick and easy yet filling dish, I have plenty of peppers in my fridge, I’ll stuff those with rice, cheese and broccoli 🙂 So tasty! yes! peppers sound amazing too! 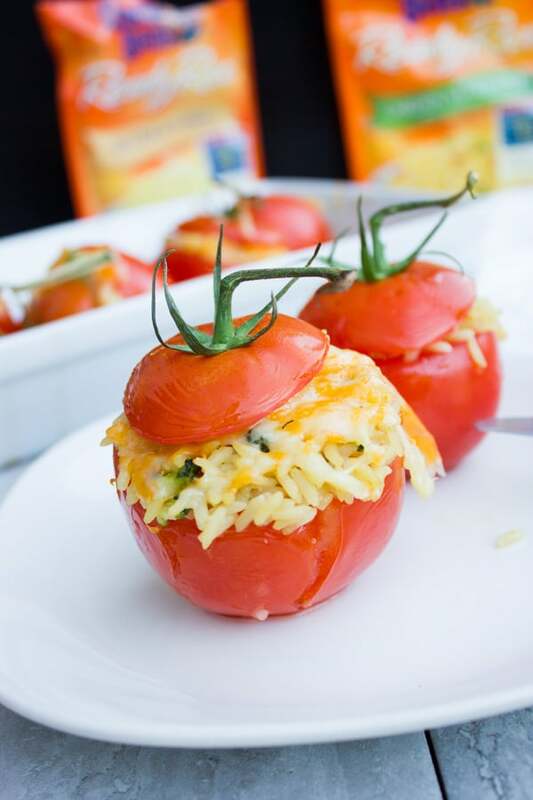 These cute stuffed tomatoes look absolutely darling! They are perfect for festive occasions as well as everyday meals. I have my fork out, ready to dig into one of these amazing beauties! I had to come back and give this amazing recipe a 5-star rating! Looks like an easy and tasty recipe. I love the stuffed rice recipe. 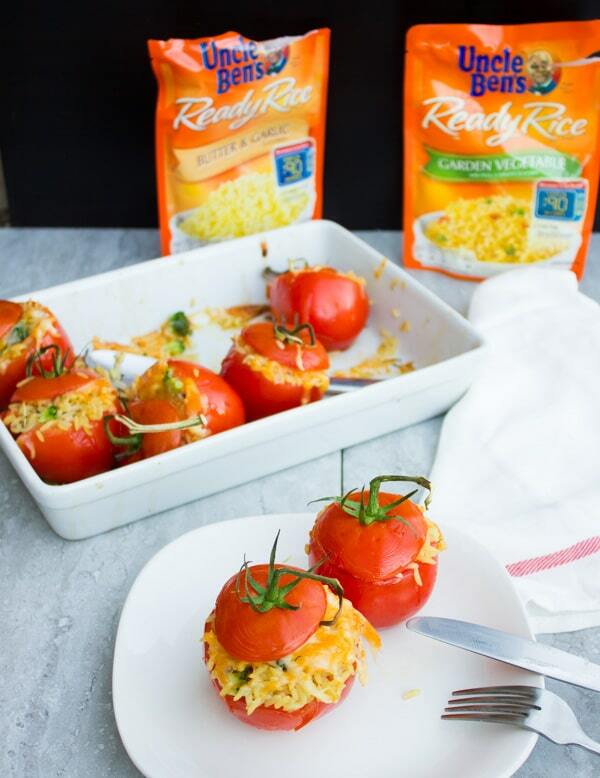 This rice stuffed in tomato looks so yummy. 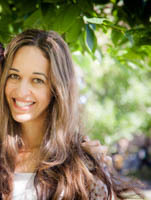 it really is Uma, thank you! What a delicious idea for a weeknight meal! Love the use of the precooked rice too, that saves 20 minutes right there! The fresh addition of the whole tomatoes is something my whole family will love. 15 minutes! I love it. 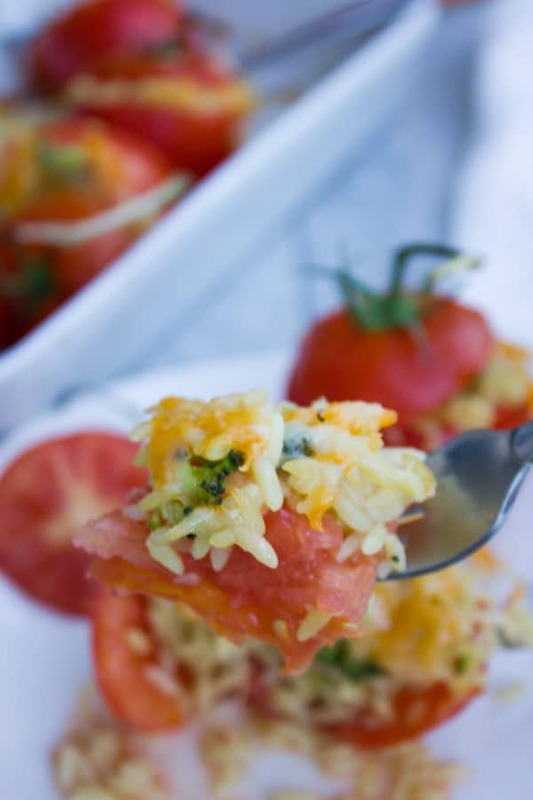 Broccoli Rice Casserole Stuffed Tomatoes sound great for my family! That is so cute your 7-year-old is a foodie. My daughter is 12 and is totally a foodie too. Her friends are staying over this weekend to cook and bake stuff, LOL.